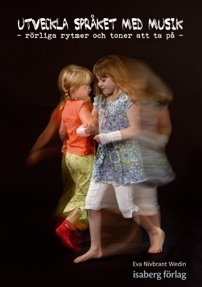 Music and language are made up of the same elements: rhythm, pulse, tempo, melody, emphasis, dynamics, and timbre. If we train to listen, distinguish, and experiment with these parameters both musical and linguistic development are influenced. 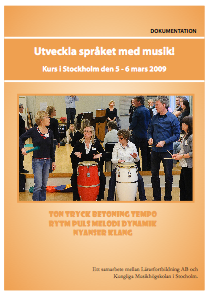 In 2005 I worked with future music teachers at the Royal College of Music in Stockholm. According to the new system of qualifications, studies on literacy development should be included in all Swedish teacher education programs – ie also for future music teachers. To fulfil the new directives, we took the help of Susanne Weiner Ahlström. This was the beginning of an interesting and productive relationship. Susanne began to teach our students, and in 2008 we were granted funds by the Alice Tegnérs Foundation to explore the relationship between reading and writing development and music/eurhythmics. We studied current research, tried different exercises, discussed and learned from each other. The work resulted in courses for music education students and active teachers. We made our own course materials and I made a compendium of exercises. Through the years I changed, added to, and got feedback from teachers who used the material. Gradually many people began asking for the material and therefore I decided to compile it, which was the beginning of the book Utveckla språket med musik, which was published in 2013. Del 2 av boken kommer i augusti 2015. Den är en direkt fortsättning på första boken och innehåller fler sånger och aktiviteter. Part 2 of the book will be released in August 2015. It is a continuation that includes more songs and activities. Part 2 also contains a CD recorded by KMH’s students. Most of the songs are available in two versions – both with vocals and in a sing-along version. Susanne and I now work together in many different ways. We teach students at the Royal College of Music, and we have courses arranged by Lärarfortbildning AB. We also give lectures and shorter courses, both together and separately.